This was a beautiful story that reminded us that we are cared for and though of by our maker and savior. The book is filled with wonderful illustrations that capture the heart of the story and draw the readers attention. I really enjoyed the message throughout the story; angels are there for us when we call on them and need them, even when we cannot see it. This is a short, with easy to read rhyming book. The words are simple enough that are great for helping a young child build up their vocabulary and love of the Lord at the same time. I received a copy of this book from the author via Pump Up Your Books in exchange for my honest review. Michelle Beber has certifications as an Angel Intuitive and Angel Oracle Card Reader from renowned “angel lady,” Doreen Virtue, as well as certifications as a Spiritual Teacher and Archangel Life Coach from Doreen’s son, Charles Virtue. 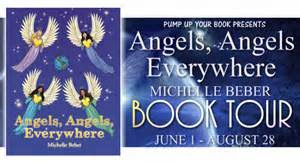 In 2008, Michelle’s life changed when she attended a spiritual retreat and learned about angels and how they communicate through repetitive number sequences known as “angel numbers.” Little did she know that this insight would lead her on an amazing spiritual journey that would directly connect her with angels and result in the discovery of her life purpose. Always grateful for the spiritual guidance she has received, Michelle looks forward to sharing the knowledge she has gained to inspire others, especially children. Michelle is a member of the Society of Children’s Book Writers and Illustrators (SCBWI).